Tree Swallows have an entirely white underside and an entirely colored upper side of dark metallic blue. The male is a very strong blue, whereas the female is a duller tone of blue. Tree Swallows, as with all swallows, are fast and agile in flight. They have a small notch in their tail, as do several of the swallow species. 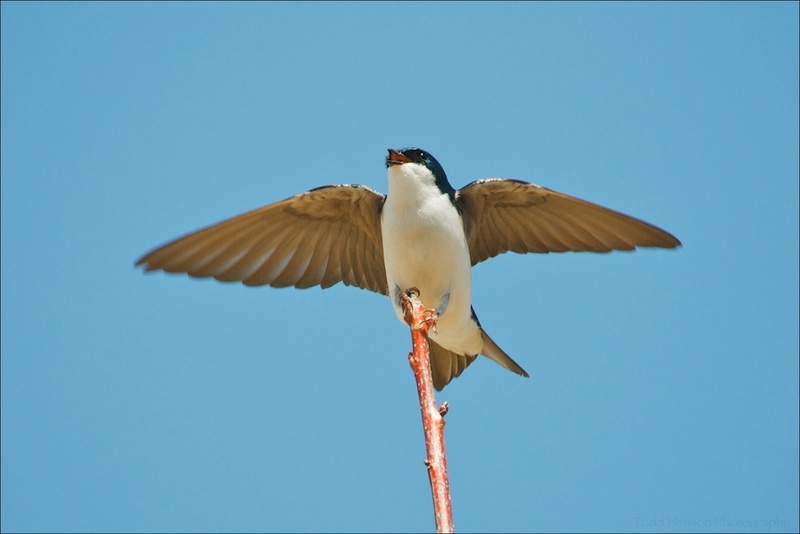 I have been lucky enough to photograph Tree Swallows on several occasions. They do not appear to be overly wary of people, making it fairly easy to get close enough for decent photos. They are often high up in the trees, though, which does present its challenges. Many of the Tree Swallows I've photographed have been very vocal, and very active. One ongoing goal of mine is photographing swallows (or any small bird) in flight. It's very challenging considering how fast they fly, but every so often I manage a decent shot.